Write your code and hit run button on the top. And you will see the output in output section. You can also save your code (Save button). Once you save the code, then copy the URL and use it for future reference. It also maintains version. Allows to share the page with social media websites. Support to mark the first version as base version. I use this website to make demo for my post to share with my you guys. There are many features which you can explore. So what are waiting for? Start using jsFiddle. As you can see from the screenshot, website interface is divided into 3 parts. First part to select libraries. There are various libraries available. Second to write your HTML, CSS and Script. The good thing about this website is you can also debug your code step by step which is a very nice feature. jsBin is another cool website to fulfill your purpose. 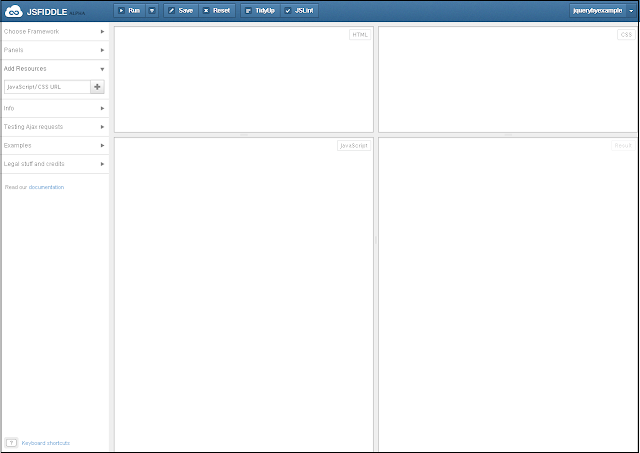 Before jsFiddle, I used this website a lot to create demos for my blog post. 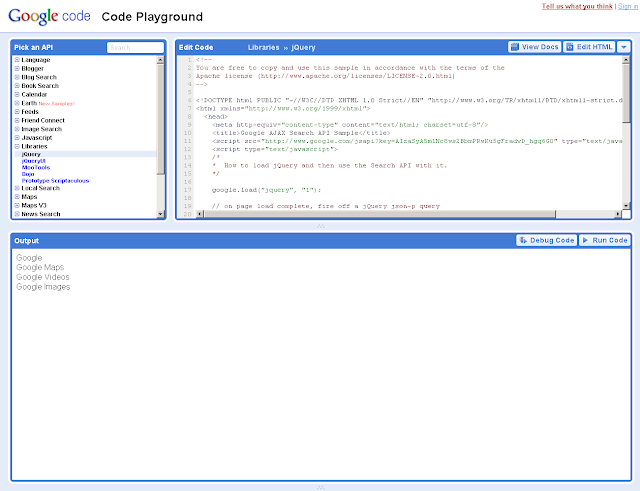 Like jsFiddle, this website also provides separate section for HTML, Script and Real Time Preview. 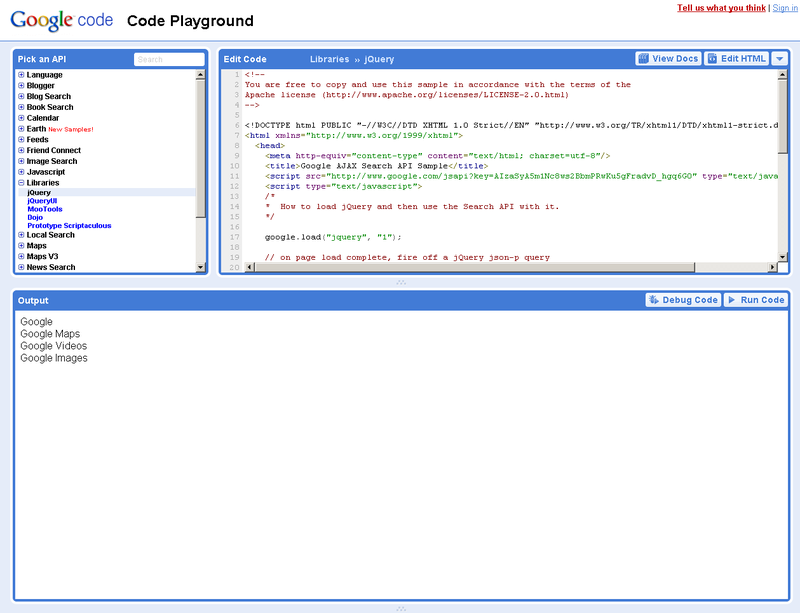 jsBin also provide 2 different views "Code" and "Render". When you click on Render view, you will see the output section in complete page which is sometimes very useful as the Real Time Preview section is small and it sometimes may not be useful to see the complete output. One disadvantage with this website is, it does not provide an inbuilt mechanism to select any library. You need to reference it from any of the CDN. Read "Why to use Google hosted jQuery CDN". Visit here to find out all the features of jsBin. 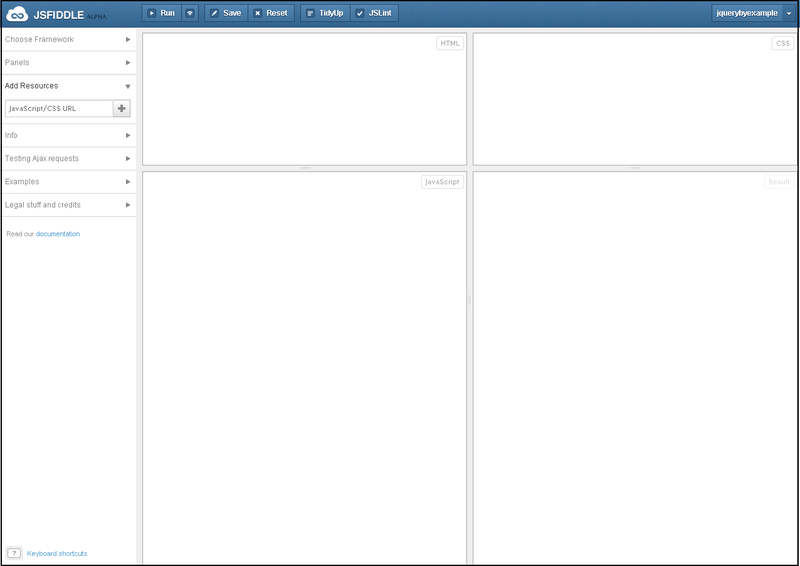 Personally, I prefer jsFiddle due to its wide range of features. So what are you waiting for. Just play with these sites and start using them regularly for your jQuery code.